Glioblastoma is the most common and aggressive primary brain malignancy in adults, with most tumors recurring after initial treatment. Tumor Treating Fields (TTFields) therapy is the newest treatment modality for glioblastoma. Here, we describe the proper application of TTFields-transducer arrays on patients and discuss theory and aspects of treatment. Riley, M. M., San, P., Lok, E., Swanson, K. D., Wong, E. T. The Clinical Application of Tumor Treating Fields Therapy in Glioblastoma. J. Vis. Exp. (146), e58937, doi:10.3791/58937 (2019). Glioblastoma is the most common and lethal form of brain cancer, with a median survival of 15 months after diagnosis and a 5 year survival rate of only 5% with current standard of care. Tumors often recur within 9 months following initial surgery, radiation and chemotherapy, at which point treatment options become limited. This highlights the pressing need for the development of better therapeutics to prolong survival and increase the quality of life for these patients. Tumor Treating Fields (TTFields) therapy was developed to take advantage of the effect of low frequency alternating electrical fields on cells for cancer therapy. TTFields have been demonstrated to disrupt cells during mitosis and slow tumor growth. There is also growing evidence that they act through stimulating immune responses within exposed tumors. The advantages of TTFields therapy include its noninvasive approach and increased quality of life compared to other treatment modalities such as cytotoxic chemotherapies. The Food and Drug Administration approved TTFields therapy for the treatment of recurrent glioblastoma in 2011 and for newly diagnosed glioblastoma in 2015. We report on the effects of TTFields during mitosis, the results of electric fields modeling, and proper transducer array placement. Our protocol outlines the clinical application of TTFields on a patient post-surgery, using the second-generation device. Glioblastoma is the most common primary malignant brain tumor in adults. Due to its properties as a cytologically malignant, mitotically active, angiogenically proliferative and necrosis-prone neoplasm typically associated with rapid pre- and post-operative disease evolution and near-universal fatal outcome, the World Health Organization designated glioblastoma as a grade IV neoplasm1. Despite basic and translational research efforts, there is no curative treatment for glioblastoma. The 5 year survival rate of patients diagnosed with glioblastoma remains approximately 5%, highlighting the pressing need for more effective therapeutic interventions2. TTFields are low-intensity, intermediate-frequency (100-300 kHz) alternating electric fields that permeate tumor-bearing tissues and are produced by insulated electrodes adhered externally to the patient's skin3. TTFields are thought to interfere with biological processes of tumor cells by exerting electromagnetic forces on intracellular molecules with high dipole moments during mitosis. 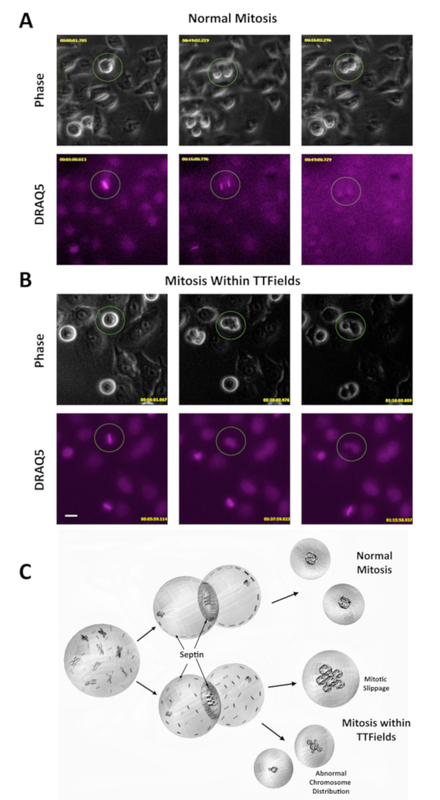 TTFields exposure during mitosis resulted in aberrant mitotic exit leading to abnormal chromosome segregation, cellular multinucleation, and caspase dependent apoptosis of daughter cells4. These effects were frequency dependent and contingent on the incident direction of the field with relation to the mitotic plates of affected cells. The cells with mitotic plates perpendicular to the fields exhibited the greatest severity of damage. The intermediate frequency range is unique because it constitutes a transition region in which strength of the intracellular electric field, which is shielded at lower frequencies, increases significantly5. The threshold at which this increase occurs depends on the dielectric properties of the cell membrane5. For glioma cells, the optimal frequency of the TTFields with respect to both cell counts in culture and clonogenic assays is 200 kHz6. Using patient-specific MRI measurements, a personalized mapping of electric fields can be developed by incorporating the volume, electric conductivity, and relative permittivity of different tissue structures in the brain7,8. Furthermore, an end-to-end, semi-automatic segmentation-based workflow can also be utilized to generate a personalized finite element model for the delineation of intracranial TTFields9. 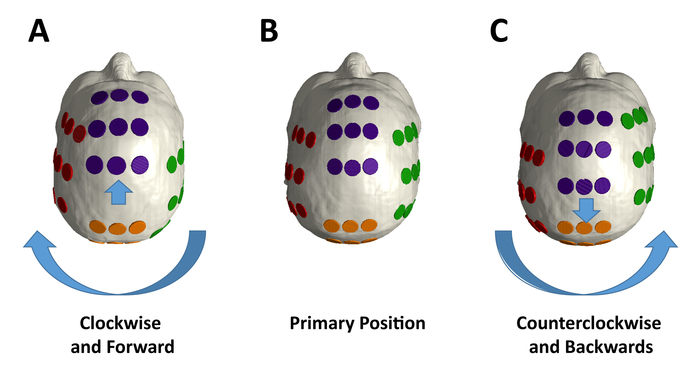 Electric fields maps demonstrating the distribution of electric fields within the patient brain may have utility for guiding optimal placement of transducer arrays to maximize field strength within the tumor. The precise mechanisms by which TTFields drive mitotic disruption are not completely understood, but two potential mechanisms by which electric fields may affect mitosis have been proposed. One involves the electric field's direct action on proteins with high dipole moments resulting in their functional perturbation; the second is dielectrophoresis of ions, causing a mislocalization of ions within the dividing cell that may interfere with cytokinetic furrow ingression3. Two proteins with high dipole moments have been proposed as targets, the α/β-tubulin monomer and the Septin 2, 6, 7 heterotrimer, with dipole moments of 1740 D10 and 2771 D11, respectively. It has been suggested that TTFields decrease the ratio between polymerized and total tubulin, preventing proper mitotic spindle assembly and perturbing the cells at the transition from metaphase to anaphase4. Cells exposed to TTFields show normal progression until metaphase, but then exhibit reduced septin localization to the anaphase spindle midline and cytokinetic furrow11. The cells undergo uncontrolled membrane blebbing that leads to aberrant mitotic exit12. The resulting post-mitotic cells exhibit abnormal nuclear architecture such as micronuclei, signs of cellular stress, and an overall decrease in cellular proliferation including G0 arrest followed by apoptosis11. Research has shown an up-regulation in calreticulin and secretion of HMGB1 in TTFields treated cells, both hallmarks of immunogenic cell death13,14. Kirson et al. showed treatment of tumors reduced the metastatic potential, and the metastases within TTFields-treated animals showed an increase in CD8+ cells15. Together, these data support a mechanism of action that extends beyond direct effects on mitosis, and likely initiates antitumor inflammatory responses. Both first and second generation TTFields devices deliver alternating electric fields to the supratentorial brain for the treatment of glioblastoma. The device was first approved by the FDA in 2011 for the treatment of patients with recurrent glioblastoma and approved in 2015 for the treatment of patients with newly diagnosed glioblastoma16,17. Glioblastoma treatment should be undertaken in a multimodal fashion, with neurosurgical intervention, radiation oncology input, and chemotherapy administration. Since TTFields represent an additional anti-cancer treatment modality with few toxicities, neuro-oncologists should consider incorporating this therapy into current treatment regimens for both newly diagnosed and recurrent glioblastoma18,19. In the newly diagnosed setting, standard treatment approach consists of concurrent radiation and temozolomide followed by maintenance temozolomide. In 2004, a randomized phase III trial showed improved median and 2-year survival for patients with glioblastoma treated with radiotherapy and concomitant and adjuvant temozolomide20. Benefits of adjuvant temozolomide with radiotherapy lasted throughout at least 5 years of follow-up21. However, patient 06-methylguanine-DNA methyltransferase (MGMT) methylation status identified those most likely to benefit from the addition of temozolomide22. In another randomized clinical trial of patients with glioblastoma who had received standard radiation and concomitant temozolomide chemotherapy, the addition of TTFields to maintenance temozolomide chemotherapy resulted in improved outcomes compared to those that received maintenance temozolomide alone23. Additionally, research has shown that TTFields work irrespective of patient MGMT promoter methylation status; therefore TTFields may constitute a clinical intervention that also works in patients with unmethylated MGMT status24. Taken together, these studies suggest broad implications on the effectiveness of TTFields for the treatment of glioblastomas. Specifically, after radiation, incorporating TTFields in combination with temozolomide provides an effective treatment option for newly diagnosed patients with glioblastoma. In the recurrent setting, there exists no standard treatment approach. However, bevacizumab and TTFields therapy are the two FDA-approved treatment modalities25,26. The EF-11 phase III trial of TTFields monotherapy (with 20-24 h/day usage) versus active chemotherapy in patients with recurrent glioblastoma showed comparable overall survival, while toxicity and quality of life favored TTFields27. Therefore, bevacizumab alone, TTFields monotherapy, or a combination of both constitutes treatment options for those with recurrent glioblastoma. A previous JoVE publication demonstrated the application of the first generation device using a plastic model of a human head25. Here, we demonstrate the application of the second-generation device on a glioblastoma patient undergoing treatment. The protocol for using the device begins with configuring transducer array layout placement on the scalp using MRI measurements and a treatment planning system. The transducer array layout map delineates the orientation and location of each of the four arrays on the patient's head. The arrays are designed to adhere to the scalp to allow the transducers to deliver the 200 kHz frequency TTFields from an electric field generator. Patients receive treatment continuously and the arrays are typically exchanged every 3 to 4 days. In this paper we show the effects of TTFields on mitotic cells, the distribution of electric fields within the brain, and the step-by-step application method of the second-generation device on a human head to demonstrate treatment of a patient with glioblastoma. The presentation of this protocol follows ethical guidelines at Beth Israel Deaconess Medical Center and written authorization was obtained from the patient. NOTE: The system consists of the portable electric field generator, transducer arrays, a connection cable and box, a rechargeable battery, charger for portable batteries, and a plug in power supply. Acquire MRI images of the patient’s brain. The MRI scan includes the margins of the scalp for treatment planning. Incomplete delineation of the full thickness of the scalp interferes with the electric field calculations. Using axial T1 sequence MRI scans and the tools on the DICOM image viewer, take baseline measurements of the front to back, right to left, and right to midline based on axial view head size (mm). Measure the superior to tentorium, right to left, and right to midline based on coronal view head size (mm). Focusing on the primary lesion, measure the front to back without nose, right to left, right to midline, right to close tumor margin, right to far tumor margin, front to close tumor margin, and front to far tumor margin based on axial view tumor size (mm). Measure the superior to tentorium, right to left, right to midline, right to close tumor margin, right to far tumor margin, superior to close tumor margin, and superior to far tumor margin based on coronal view tumor size (mm). Open treatment planning software, enter username and password, and select new patient transducer array. Enter in the measurements taken above, and click Generate Transducer Array Placement. Save the transducer array layout for future use on patient visit. Prepare the scalp for transducer array placement by cutting hair and shaving hair stubbles with an electric razor down to the surface of the scalp until no hair remains. Avoid using a razor with blade(s) to prevent cuts on the scalp. Wipe the scalp with 70% isopropyl alcohol. Remove the transducer arrays from plastic packaging and begin planning placement upon the scalp according to the predetermined specific array layout scheme (see section 1.1). Locate the surgical scar and avoid placing transducer arrays upon scar. If the scar is located under a predetermined transducer array, then shift the four array placements 2 cm clockwise or counterclockwise. Determine the desired location of the connection wires as preferred by the patient (either right or left side of the body). Apply the transducer array that is nearest to the surgical scar first, while positioning the connection wire to the preferred side. Apply the next transducer array to either the right lateral or the left lateral in a clockwise or counterclockwise fashion, keeping the location of the connection wire consistent. Apply the third and fourth transducer arrays in the same clockwise or counterclockwise fashion. Place gauze strips underneath the metallic interface in between the array and the connection wire. Use silk tape to hold the gauze strip in place. Braid the four connection wires together and fasten with silk tape. Place fishnet retainer over the head in order to hold the arrays in place. Connect each of the four white and black color-coded connection wires to a corresponding white or black port on the connection box, making sure each audibly snaps into place. If using the portable battery, connect the battery charger to a wall outlet and switch the power button on in order to initially charge the battery. Insert charged battery into the electric field generator by plugging it in through its connector to a socket labeled DC IN on the front panel of the device. Make sure the arrows on the battery connector face up towards the DC IN label. If not using the portable battery, plug the electric field generator into a wall outlet. Turn on the power button located at the bottom of electric field generator to start the device. Switch on the TTFields button located at the top of the electric field generator. The patient may experience a warm sensation. To achieve an optimal response, Have patient use TTFields therapy on a continuous basis for a minimum compliance of 75%, or 18 h a day. Treatment duration of less than 18 hour per day has been associated with suboptimal results. NOTE: Array exchange procedures in this section are repeated every 3 to 4 days. Use baby oil to remove adhesive from skin. Pull off arrays by applying slow and even tension with both hands. Wash scalp with gentle shampoo. Check scalp for dermatitis, erosions, ulcers, or infection. Apply anti-septic ointment as needed. If ulcers or infections are present, discontinue treatment until ulcer heals or infection clears. Clean scalp with 70% isopropyl alcohol. Reapply the transducer arrays (see section 1.2). NOTE: Dexamethasone is a synthetic fluorinated glucocorticoid that has anti-inflammatory effects in humans by impairing cell-mediated immunity. Wean dexamethasone in a stepwise fashion due to its hysteresis effect. Apply trimethopreme-sulfamethaxazole (400–80 mg single-strength tablet daily or 800–160 mg double-strength tablets three times per week) to prevent the development of pneumocystic pneumonia during the weaning process. Cut the dose half quickly every 7–10 days to achieve a daily dose of 4 mg/day. If the patient is already at 4 mg/day or lower the dose, cut the dosage slower, at a rate of every 10 to 14 days until discontinuation. Look for signs of adrenal suppression (i.e., lethargy, cold intolerance, weakness and hypersomnia). If signs of unacceptable neurologic deficits and/or adrenal suppression appear, the previous dose of dexamethasone is re-applied. NOTE: Other means for reduction of dexamethasone are being sought (see concurrent bevacizumab administration). NOTE: Bevacizumab is a humanized anti-vascular endothelial growth factor (VEGF) monoclonal IgG1 antibody. The antibody has a potent antiangiogenic effect by sequestering VEGF, rendering it unable to bind to the cognate receptors VEGFR1 and VEGFR2 and to exert its proangiogenic effect. Immature blood vessels also have high permeability and elimination of these newly generated vasculature within the glioblastoma microenvironment also helps to reduce cerebral edema. Bevacizumab has a long half-life of about 20 days28 and therefore it can be administered to patients every 2 to 3 weeks as an intravenous infusion. The indication for bevacizumab is to obviate the prolonged use of dexamethasone. Exclude bevacizumab from patient who had recent hemorrhage (either intracranial or extracranial), myocardial infarction or stroke, major surgery (including craniotomy) within 4 weeks, uncontrolled hypertension, pregnancy or lactation. Exercise caution in patients with chronic kidney disease, proteinuria, bleeding disorder, uncontrolled angina, cardiac arrhythmia, congestive heart failure, prior chest wall irradiation, prior anthracycline exposure or other concurrent illness deemed unfit by the treating physician. Before treatment, make sure the patient has acceptable blood counts, kidney function, normal blood pressure and urine dipstick protein <100 mg/dL. Once the patient is deemed to be an acceptable candidate, administer bevacizumab at a dose of 2.5, 5.0, or 10 mg/kg. There is class 2 evidence that bevacizumab at doses of <10 mg/kg work as well as 10 mg/kg29,30. Start TTFields treatment either before or after initiation of bevacizumab. Infuse the initial dose of bevacizumab over 60 min in 100 cc of normal saline. If there is no adverse event, administer subsequent doses over 30 min. NOTE: There are a number of anti-cancer drugs that also have significant immunosuppressive properties. They are listed below. To avoid everolimus, which is an mTOR inhibitor. NOTE: Everolimus is approved to treat subependymal giant cell astrocytoma, advanced hormone-receptor-positive, Her2-negative breast cancer, pancreatic neuroendocrine tumors and renal cell carcinoma. However, the addition of everolimus has been shown definitively in a randomized study to hasten the death of glioblastoma patients, most likely by impairing their anti-tumor cell-mediated immunity31. It is also used to prevent rejection of transplant organ recipients. Avoid Sirolimus, which is also known as rapamycin. NOTE: Temsirolimus is a pro-drug that can be metabolized to sirolimus. It is an mTOR inhibitor with immunologic interference properties similar to everolimus. It is also used to prevent rejection of transplant organ recipients. TTFields cause disruption during mitosis leading to an asymmetric distribution of chromosomes and misalignment of metaphase plates during mitosis, (compare Figure 1A and Figure 1B). TTFields are thought to exert their effect by perturbing the function of high dipole moment possessing proteins such as α/β-tubulin or septin. One proposed model for TTFields action on mitotic cells is that they perturb septin function. Normally, septin acts to organize the cytokinetic furrow and to reinforce the structurally important interaction between the subcortical actin cytoskeleton and the overlying plasma membrane that is needed to resist intracellular hydrostatic forces produced during furrow ingression. This results in a loss of structural integrity within the dividing cells that is necessary for normal mitosis, resulting in the disruption of chromosomal segregation and cytokinetic furrow function leading to aberrant mitotic exit (Figure 1C). Electric field intensity is not homogenous within the brain of patients undergoing TTFields treatment32. Electrical conductivity and relative permittivity of individual tissue types and their volume results in a variation of electric field intensity and distribution within the brain, shown in Figure 2A,B. Therefore, transducer array placement may have an effect on electric field strength in the region of the tumor. An example of this variability is shown in Figure 2C, which predicts the electric field strength within the patient's brain at adjacent axial, coronal, and sagittal slices. Figure 3A shows the personalized output of the treatment planning software for the proper placement of the arrays on a patient, shown in Figure 3B. Scalp sensitivity to the arrays can be alleviated by topical application of corticosteroids and by shifting the arrays as described in Figure 4. The above protocol was used to treat a 56-year-old woman who developed a hemorrhage in the left frontal brain. She underwent a gross total resection of the hemorrhagic mass and the pathology showed IDH-1 mutated glioblastoma with hypercellularity, cellular atypia, mitotic figures and necrosis. She subsequently received external beam radiotherapy and daily temozolomide. Dexamethasone was stopped early at the second week of radiation. She experienced pancytopenia due to temozolomide administered during the adjuvant phase of treatment, requiring growth factor support as well as platelet and blood transfusions. Increased gadolinium enhancement was noted on head MRI 5 months after diagnosis and bevacizumab was started. Eight months after diagnosis TTFields therapy was also added. She has been maintained on the regimen of bevacizumab and TTFields for 48+ months after the diagnosis of her glioblastoma. The MRI images of this patient revealed stable disease for 48 months after initial diagnosis of glioblalstoma, shown in Figure 5. She has survived thus far with a high Karnofsky score of 80. Figure 1: TTFields disrupt mitosis during cell division. (A) Phase contrast microscopy was used to observe HeLa cells during mitosis. DRAQ5 is a DNA stain and was used to monitor chromosomal behavior. Image taken from a video of cells undergoing normal mitosis, included as an additional supplement. The procedures for obtaining video images were described in previous work11. (B) Phase contrast and DRAQ5 under TTFields show cell blebbing and aberrant mitosis. Scale bar = 20 µm. Image taken from a video of cells undergoing mitosis during TTFields treatment, included as an additional supplement. The procedures for obtaining video images were described in previous work11. (C) Proposed model for TTFields-induced mitotic disruption. TTFields perturb septin association with the cytokinetic furrow and the subcortical actin cytoskeleton. This creates insufficient furrow contractility and makes cells vulnerable to plasma membrane rupture from the underlying cytoskeleton, resulting in membrane blebbing. This leads to aberrant mitotic exit including mitotic slippage (failure to divide) and asymmetric cell division. Please click here to view a larger version of this figure. Figure 2: In situ electric field intensities vary within tissues based on electric conductivity and relative permittivity of the tissues they pass through. (A) Electric Field-Volume Histogram (EVH) shows the magnitude of electric field strength. (B) Specific Absorption Rate-Volume histogram (SARVH) shows the rate of energy absorbed in different tissues. (C) Representative field mapping of a patient with a left frontal glioblastoma, showing field strength within distributions on axial, coronal and sagittal slices. Green arrows indicate location of tumor. Relative electric field intensity is arbitrary. Please click here to view a larger version of this figure. Figure 3: Clinical application on a glioblastoma patient after surgery, radiation and temozolomide. (A) Treatment planning software output showing placement of the 4 arrays. (B) Array placement on the patient. Please click here to view a larger version of this figure. Figure 4: Array placement variation during treatment. (A) The individual lateral arrays should be rotated in aggregate by 2 cm from their primary position in a clockwise fashion, and the frontal and posterior arrays moved forward by 2 cm from the (B) primary positions for array placement position, which are based on the output from the treatment planning software for the individual patient. (C) The individual electrodes in each array should be rotated in aggregate by 2 cm from the primary position in a counterclockwise fashion, and the anterior and posterior arrays moved in aggregate by 2 cm backwards. Please click here to view a larger version of this figure. Figure 5: Patient MRI scans before and after TTFields treatment. 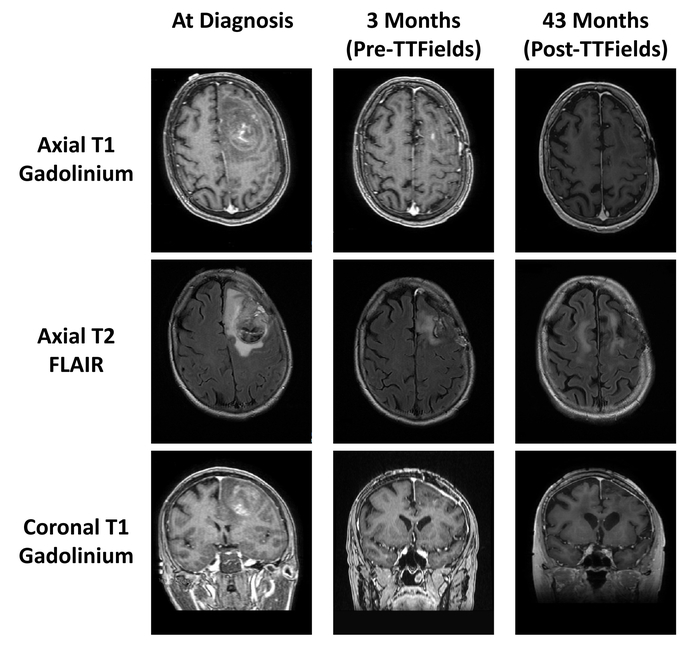 MRI scans at diagnosis (left column), MRI scans after surgery, radiation, and temozolomide (middle column), and MRI scans after 43 months of TTFields treatment (right column). Please click here to view a larger version of this figure. This article demonstrates the proper application of the second generation TTFields device to treat glioblastoma patients. The significance of TTFields therapy with respect to alternative treatments includes reduced toxicity, increased quality of life, and higher median overall survival especially when combined with temozolomide chemotherapy. Furthermore, we show in a step-by-step fashion the proper application of the transducer array onto the scalp, while avoiding pitfalls that may cause complications. In addition, we provide a detailed account of the cell biology effects of TTFields as well as electric field mapping as TTFields penetrate into the brain. A few steps in the protocol are particularly critical for the successful implementation of the device. For proper treatment planning, the MRI images of the patient's brain must include the margins of the scalp. To ensure adequate contact between electrode and scalp, the hair stubbles must be shaved down to surface of the scalp until no hair remains. It is important to locate any surgical scars and avoid placing transducer arrays on the scar to obviate complications from scalp breakdown. During each exchange, check the scalp for dermatitis, erosions, ulcers or infection and, if needed, stop application of arrays until ulcers are healed and infections are resolved33,34. The improvement of life expectancy depends most on high patient compliance of 18 hours per day or more. A post hoc analysis of the EF-11 phase III trial data showed significantly longer median overall survival in TTFields therapy patients with a compliance rate ≥75% (≥18 h daily) versus those with a <75% compliance rate (7.7 versus 4.5 months, p = 0.042)35. Patients who are less than 75% compliant appear to receive little benefit, while those who pass the 75% compliance cut-off exhibited significant benefit. Physician guidance and family support plays an important role in achieving higher patient compliance, and advice on application can be given so that the patient is more comfortable wearing the arrays for longer periods of time. Ambient temperature should remain in a comfortable range while wearing the arrays. Regular intervals of array changes, hair shaving of the scalp, and placement of a breathable net on the head to hold the arrays in place may also improve comfort leading to higher compliance. There is accumulating evidence that TTFields treatment works better when combined with other therapies. TTFields were used as a monotherapy in the EF-11 pivotal phase III trial, and the median overall survival was 6.6 months for the TTFields arm compared to 6.0 months for the chemotherapy arm. Although these initial results showed no statistically significant improvement in overall survival over standard-of-care treatment, fewer severe adverse events and improved quality-of-life measures were noted in the TTFields arm which formed the basis for its approval for recurrent glioblastoma by the FDA27. The later EF-14 phase III trial on newly diagnosed glioblastoma showed a median overall survival of 20.9 months in the TTFields-temozolomide arm versus 16.0 months in the temozolomide-alone arm36,37. Another study on TTFields in clinical practice using the PRiDe registry showed a median overall survival of 9.6 months, which was significantly longer than the median overall survival in the control arm of EF-1135. Furthermore, preclinical data have shown that adding in alkylating agents like temozolomide improves tumor cell kill in tissue culture24. The PRiDe registry and EF-14 data support this concept because these patients had better outcomes when they received concurrent temozolomide and/or other treatments added to TTFields. Wong et al. showed similar results by comparing TTFields therapy and bevacizumab alone or in combination with a regimen consisting of 6-thioguanine, lomustine, capecitabine, and celecoxib (TCCC). The TCCC group exhibited prolonged overall survival, median 10.3 months versus 4.1 months for TTFields and bevacizumab alone38. Collectively, these data support the addition of adjuvant therapies to increase the effectiveness of the device in treating glioblastoma. In the EF-14 trial, the patients that received TTFields in the experimental arm had a longer overall survival compared to the controls, but there was no difference between the experimental and control arms in the EF-11 trial. The EF-14 trial added a known therapeutic agent, temozolomide, which appears to combine synergistically with TTFields treatment. Another potential explanation for this difference may be due to the chemotherapy näive status of newly diagnosed patients, which may enable them to mount a more effective anti-tumor immune response. Although the mechanism of an immune response from TTFields remains unclear, dexamethasone as an immunosuppressive agent may negate this benefit and has been shown to lower median survival when combined with TTFields39,40,41. In conclusion, lowering patients’ dose of dexamethasone while on TTFields would increase the number of immune cells in the blood of glioblastoma patients and could lead to a stronger response and improved treatment result. TTFields may also sensitize tumor cells to the effects of ionizing radiation42,43. However, the selection of combination therapy should be individualized with respect to the neurologic and medical conditions of the patient. The TTFields device was approved by the FDA for the treatment of adult patients with recurrent and newly diagnosed glioblastoma at age 22 years and older; the efficacy of this device for patients under 22 years is unknown. Furthermore, the side effects are unknown when the patient is using TTFields concurrently with an active implanted device, such as deep brain, spinal cord, or vagus nerve stimulators, defibrillators, and cardiac pacemakers, or patients with a metallic fragment (i.e., bullet) or apparatus (i.e., aneurysm clip) in the brain. Known allergic reaction to electrode gels, open wounds, skull defects, and pregnancy are also contraindicated. Patients with major skull defects, such as absence of a large segment of the calvarium from craniectomy, may have a higher penetration of TTFields44; however, craniectomy is not routinely performed on glioblastoma patients. Poor patient compliance is a major limitation to this treatment modality. Factors that may decrease compliance include concurrent medical or psychiatric illness (i.e., depression)45,46,47, lack of support from caretakers, scalp breakdown due to erosions or infection, skin swelling, and dermatitis. TTFields have an unequivocal anti-mitotic effect on dividing tumor cells. Quite possibly, this effect also extends to progenitor cells but preclinical or clinical data on normal tissue is lacking. Nevertheless, TTFields therapy shows promise in multiple solid tumor types, including some of the most aggressive forms of cancer. TTFields serve as an effective antimitotic treatment in preclinical pancreatic cancer models and have a long-term negative effect on the survival of these cancer cells. These results make TTFields an attractive treatment modality for testing in patients with pancreatic cancer48. TTFields have also shown encouraging preclinical results for the treatment of ovarian cancer49 and non-small cell lung cancer15,50. Therefore, TTFields are being applied in ongoing phase III clinical trials for primary (NCT02973789) and metastatic (NCT02831959) lung cancer, pancreatic cancer (NCT03377491), and mesothelioma (NCT02397928). Hopefully, TTFields will provide additional treatment options for these difficult-to-treat malignancies. Drs. Kenneth Swanson and Eric Wong both received unrestricted research grants from Novocure, Ltd. This research was supported in part by A Reason To Ride research fund. We thank Allison Diep for creating the 3-dimensional artwork in Figure 1C. TTFields Device (Optune) Novocure, Ltd. Not applicable The system consists of the portable electric field generator, transducer arrays, a connection cable and box, a rechargeable battery, charger for portable batteries, and a plug in power supply. Louis, D. N., et al. The 2007 WHO classification of tumours of the central nervous system. Acta Neuropathologica. 114, 547-547 (2007). Ostrom, Q. T., et al. CBTRUS Statistical Report: Primary Brain and Central Nervous System Tumors Diagnosed in the United States in 2008-2012. Neuro-oncology. 17, iv1-iv62 (2015). Kirson, E. D., et al. Disruption of cancer cell replication by alternating electric fields. Cancer Research. 64, 3288-3295 (2004). Giladi, M., et al. Mitotic Spindle Disruption by Alternating Electric Fields Leads to Improper Chromosome Segregation and Mitotic Catastrophe in Cancer Cells. Scientific Reports. 5, 18046 (2015). Wenger, C., et al. Modeling Tumor Treating Fields (TTFields) application in single cells during metaphase and telophase. Conference proceedings. Annual International Conference of the IEEE Engineering in Medicine and Biology Society. 2015, 6892-6895 (2015). Porat, Y., et al. Determining the Optimal Inhibitory Frequency for Cancerous Cells Using Tumor Treating Fields (TTFields). Journal of Visualized Experiments. (123), e55820 (2017). Lok, E., San, P., Hua, V., Phung, M., Wong, E. T. Analysis of physical characteristics of Tumor Treating Fields for human glioblastoma. Cancer Medicine. 6, 1286-1300 (2017). Miranda, P. C., Mekonnen, A., Salvador, R., Basser, P. J. Predicting the Electric Field Distribution in the Brain for the Treatment of Glioblastoma. Physics in Medicine and Biology. 59, 4137-4147 (2014). Timmons, J. J., Lok, E., San, P., Bui, K., Wong, E. T. End-to-end workflow for finite element analysis of tumor treating fields in glioblastomas. Physics in Medicine and Biology. 62, 8264-8282 (2017). Mershin, A., Kolomenski, A. A., Schuessler, H. A., Nanopoulos, D. V. Tubulin dipole moment, dielectric constant and quantum behavior: computer simulations, experimental results and suggestions. Biosystems. 77, 73-85 (2004). Gera, N., et al. Tumor treating fields perturb the localization of septins and cause aberrant mitotic exit. PloS One. 10, e0125269 (2015). Gilden, J. K., Peck, S., Chen, Y. -C. M., Krummel, M. F. The septin cytoskeleton facilitates membrane retraction during motility and blebbing. Journal of Cell Biology. 196, 103-114 (2012). Wong, E. T., Timmons, J., Swanson, K. D. Abstract 1707: Tumor treating fields exert cellular and immunologic effects. Cancer Research. 78, 1707-1707 (2018). Voloshin, T., et al. Abstract 3665: Tumor Treating Fields (TTFields) plus anti-PD-1 therapy induce immunogenic cell death resulting in enhanced antitumor efficacy. Cancer Research. 77, 3665-3665 (2017). Kirson, E. D., et al. Alternating electric fields (TTFields) inhibit metastatic spread of solid tumors to the lungs. Clinical & Experimental Metastasis. 26, 633-640 (2009). Federal Drug Administration NovoTTF-100A system approval order and device summary. (2018). Federal Drug Administration NovoTTF-100A system approval for newly diagnosed glioblastoma. (2018). Wong, E. T., Lok, E., Swanson, K. D. An Evidence-Based Review of Alternating Electric Fields Therapy for Malignant Gliomas. Current Treatment Options in Oncology. 16, (2015). Magouliotis, D. E., et al. Tumor-treating fields as a fourth treating modality for glioblastoma: a meta-analysis. Acta Neurochirurgica. 160, 1167-1174 (2018). Stupp, R., et al. Radiotherapy plus concomitant and adjuvant temozolomide for glioblastoma. New England Journal of Medicine. 352, 987-996 (2005). Stupp, R., et al. Effects of radiotherapy with concomitant and adjuvant temozolomide versus radiotherapy alone on survival in glioblastoma in a randomised phase III study: 5-year analysis of the EORTC-NCIC trial. The Lancet Oncology. 10, 459-466 (2009). Hegi, M. E., et al. MGMT gene silencing and benefit from temozolomide in glioblastoma. New England Journal of Medicine. 352, 997-1003 (2005). Stupp, R., et al. Effect of Tumor-Treating Fields Plus Maintenance Temozolomide vs Maintenance Temozolomide Alone on Survival in Patients With Glioblastoma: A Randomized Clinical Trial. The Journal of the American Medical Association. 318, 2306-2316 (2017). Clark, P. A., et al. The Effects of Tumor Treating Fields and Temozolomide in MGMT Expressing and Non-Expressing Patient-Derived Glioblastoma Cells. Journal of Clinical Neuroscience. 36, 120-124 (2017). Omar, A. I. Tumor Treating Field Therapy in Combination with Bevacizumab for the Treatment of Recurrent Glioblastoma. Journal of Visualized Experiments. (92), e51638 (2014). National Comprehensive Cancer Network, Central Nervous System Cancers (Version 1.2018). (2018). Stupp, R., et al. NovoTTF-100A versus physician's choice chemotherapy in recurrent glioblastoma: a randomised phase III trial of a novel treatment modality. European Journal of Cancer. 48, 2192-2202 (2012). Lu, J. -F., et al. Clinical pharmacokinetics of bevacizumab in patients with solid tumors. Cancer Chemotherapy and Pharmacology. 62, 779-786 (2008). Wong, E. T., et al. Bevacizumab for recurrent glioblastoma multiforme: a meta-analysis. Journal of the National Comprehensive Cancer Network. 9, 403-407 (2011). Levin, V. A., et al. Impact of bevacizumab administered dose on overall survival of patients with progressive glioblastoma. Journal of Neuro-Oncology. 122, 145-150 (2015). Wong, E. T., Swanson, K. D. Everolimus shortens survival of newly diagnosed glioblastoma patients. Journal of Neuro-Oncology. 1-2 (2018). 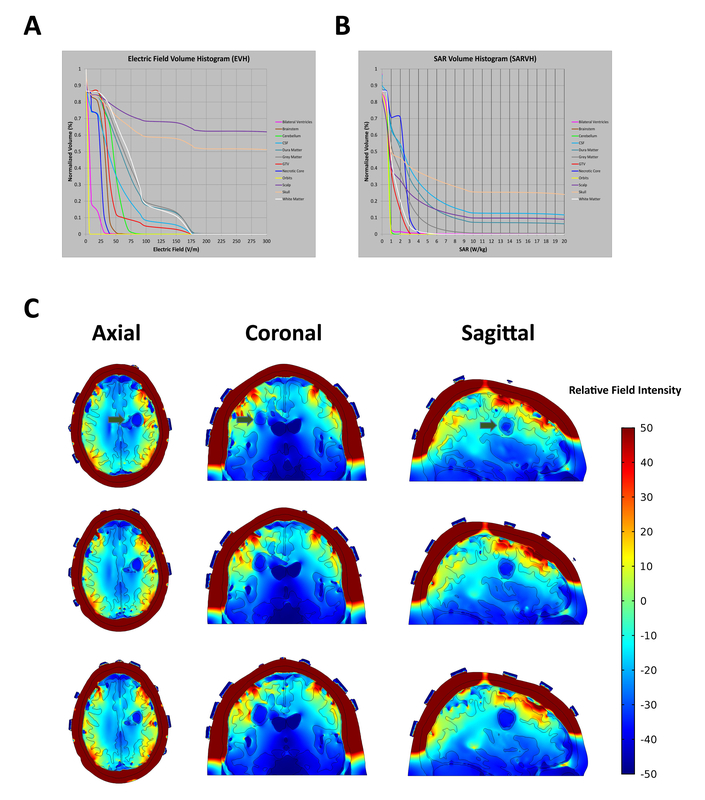 Korshoej, A. R., Hansen, F. L., Thielscher, A., von Oettingen, G. B., Sørensen, J. C. H. Impact of tumor position, conductivity distribution and tissue homogeneity on the distribution of tumor treating fields in a human brain: A computer modeling study. PLoS ONE. 12, e0179214 (2017). Lacouture, M. E., et al. Characterization and management of dermatologic adverse events with the NovoTTF-100A System, a novel anti-mitotic electric field device for the treatment of recurrent glioblastoma. Seminars in Oncology. 41, Suppl 4. S1-S14 (2014). Lukas, R. V., Ratermann, K. L., Wong, E. T., Villano, J. L. Skin toxicities associated with tumor treating fields: case based review. Journal of Neuro-Oncology. 135, 593-599 (2017). Mrugala, M. M., et al. Clinical practice experience with NovoTTF-100A system for glioblastoma: The Patient Registry Dataset (PRiDe). Seminars in Oncology. 41, (Suppl 6), S4-S13 (2014). Stupp, R., et al. Maintenance Therapy With Tumor-Treating Fields Plus Temozolomide vs Temozolomide Alone for Glioblastoma: A Randomized Clinical Trial. The Journal of the American Medical Association. 314, 2535-2543 (2015). Stupp, R., et al. Effect of Tumor-Treating Fields Plus Maintenance Temozolomide vs Maintenance Temozolomide Alone on Survival in Patients With Glioblastoma: A Randomized Clinical Trial. he Journal of the American Medical Association. 318, 2306-2316 (2017). Wong, E. T., Lok, E., Swanson, K. D. Clinical benefit in recurrent glioblastoma from adjuvant NovoTTF-100A and TCCC after temozolomide and bevacizumab failure: a preliminary observation. Cancer Medicine. 4, 383-391 (2015). Dubinski, D., et al. Dexamethasone-induced leukocytosis is associated with poor survival in newly diagnosed glioblastoma. Journal of Neuro-Oncology. 137, 503-510 (2018). Pitter, K. L., et al. Corticosteroids compromise survival in glioblastoma. Brain: A Journal of Neurology. 139, 1458-1471 (2016). Chitadze, G., et al. In-depth immunophenotyping of patients with glioblastoma multiforme: Impact of steroid treatment. Oncoimmunology. 6, e1358839 (2017). Silginer, M., Weller, M., Stupp, R., Roth, P. Biological activity of tumor-treating fields in preclinical glioma models. Cell Death, Disease. 8, e2753 (2017). Karanam, N. K., et al. Tumor-treating fields elicit a conditional vulnerability to ionizing radiation via the downregulation of BRCA1 signaling and reduced DNA double-strand break repair capacity in non-small cell lung cancer cell lines. Cell Death & Disease. 8, e2711 (2017). Korshoej, A. R., et al. Enhancing Predicted Efficacy of Tumor Treating Fields Therapy of Glioblastoma Using Targeted Surgical Craniectomy: A Computer Modeling Study. PLoS ONE. 11, e0164051 (2016). Litofsky, N. S., Resnick, A. G. The relationships between depression and brain tumors. Journal of Neuro-Oncology. 94, 153-161 (2009). Litofsky, N. S., et al. Depression in patients with high-grade glioma: results of the Glioma Outcomes Project. Neurosurgery. 54, discussion 366-367 358-366 (2004). Mainio, A., et al. Depression in relation to survival among neurosurgical patients with a primary brain tumor: a 5-year follow-up study. Neurosurgery. 56, discussion 1241-1242 1234-1241 (2005). Giladi, M., et al. Mitotic disruption and reduced clonogenicity of pancreatic cancer cells in vitro and in vivo by tumor treating fields. Pancreatology. 14, 54-63 (2014). Voloshin, T., et al. Alternating electric fields (TTFields) in combination with paclitaxel are therapeutically effective against ovarian cancer cells in vitro and in vivo. International Journal of Cancer. 139, 2850-2858 (2016). Giladi, M., et al. Alternating Electric Fields (Tumor-Treating Fields Therapy) Can Improve Chemotherapy Treatment Efficacy in Non-Small Cell Lung Cancer Both In vitro and In vivo. Seminars in Oncology. 41, S35-S41 (2014).